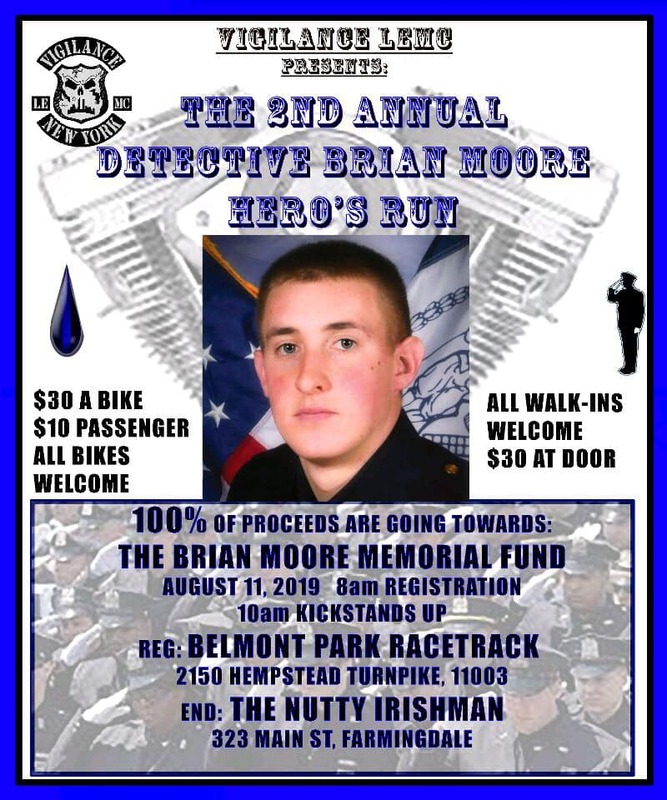 On behalf of the entire membership of the Vigilance Law Enforcement Motorcycle Club, we would again like to ask you for your support in the Detective Brian Moore, 2nd Annual Hero’s Run to be held on Sunday August 11th, 2019. Join Vigilance LEMC in raising money for a scholarship fund for Plainedge students in honor of Brian’s name. Last year, with your help, we were able to raise over $15,000 for the Brian Moore Memorial Fund. This year’s Motorcycle Run and Fundraising Event will take place on August 11th, 2019 ending at The Nutty Irishman in Farmingdale. You do not have to wait until August 11th to donate, and make a difference. Please give what you can so we can continue to honor Brian for his sacrifice and keep his memory in our hearts and minds always.